RIM announces match between Wales and South Africa in Washington D.C.
WASHINGTON D.C. - In a special ceremony at the South African Embassy, The Welsh Rugby Union and South African Rugby Union announced today a rugby match between their world-renowned teams at Washington's RFK Stadium on Saturday evening, June 2. Tickets for the match, which is being promoted by USA Rugby's commercial arm, Rugby International Marketing (RIM), will go on sale beginning Tuesday, March 13. Announcing the match today were the First Minister of Wales, Rt. Hon. Carwyn Jones AM, and the South African Ambassador to the United States, Mninwa Johannes Mahlangu. Both dignitaries spoke of their excitement regarding the match, the first contest between top-tier national teams to be held in the U.S. capital and participated in a jersey exchange to commemorate the landmark event. Representatives from RIM, the events local organizing committee, and RFK Stadium were also on hand for the announcement. First Minister of Wales, Carwyn Jones noted, "It is fantastic to be here with the South African Ambassador to the US, Mninwa Johannes Mahlangu, to announce this exciting fixture between our two great countries. "Wales and the Springboks have a huge global fan base and I am confident this clash of titans at Washington's world famous RFK Stadium will help raise the profile of rugby in America. I, for one, can't wait until June 2." 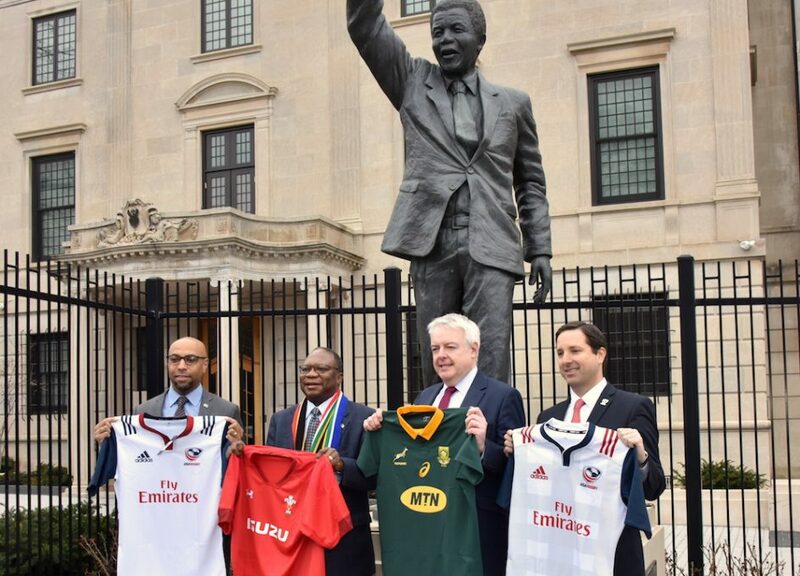 "We look forward to welcoming the two rugby teams to Washington DC in June," added South African Ambassador, Mninwa Johannes Mahlangu, "using the vehicle of Rugby to make a difference, bringing our three nations closer together and leaving a legacy which President Mandela would be proud of." Welsh Rugby Union Group CEO, Martyn Phillips added: "This is an exciting fixture for the WRU and for the national squad. It enables us to add a third fixture into the squad's schedule as they continue with their preparations for the 2019 RWC and for the Union it is a great opportunity to showcase Wales and our game in the capital of the United States. "The opportunity to expand the already great Welsh support base and Welsh brand is very exciting for us, especially in such a large demographic and audience as the U.S.
"We have long standing links with the U.S with our partner Under Armour and it is great we are able to stage a match just down the road from their main facility in Baltimore. "We would like to thank RIM for staging and promoting the fixture and we are looking forward to kicking off the summer tour in Washington, D.C"
The Welsh and South African teams have had a long and storied rivalry. In the most recent installment last December, at Principality Stadium in Cardiff, the Welsh narrowly edged the Springboks for a 24-22 victory. Each nation has hosted the other at least once per year in recent memory, trading victories on each occasion. The June event, however, marks the first time they have squared off in the United States. Currently ranked No. 6 in the World Rugby rankings, Wales will make their first appearance on American soil since a contest with the United States in 2009, while No. 5 ranked South Africa will return after a 17-year absence, having defeated the Men's USA Eagles in 2001, in Houston. Washington will serve as an ideal venue for the game, as it is the second largest metropolitan region in the country in terms of membership in USA Rugby, a hotbed of high-school, college and club rugby. "The match in Washington allows us to take Springbok rugby to America and to potentially expand the team's appeal to very large audience," said Jurie Roux, South African Rugby Union CEO. "Our research shows that the Springboks have a growing worldwide fan base and we see the match in Washington as ideal platform to tap into a market that offers huge possibilities for South African rugby, in the exciting American sporting area." Roux continued, "We are also grateful to the Wales Rugby Union for their efforts in making this match a reality and it will get a very challenging international season off to a great start." The event also marks the first stand-alone match promotion for RIM. Created in 2015, RIM is the for-profit commercial arm of USA Rugby tasked with creating new revenue streams to fund the growth of rugby in America. RIM's events portfolio includes all home test matches for the Men's and Women's USA national teams and the USA Rugby national championships for Men's and Women's collegiate rugby. The company is also responsible for organizing the quadrennial Rugby World Cup Sevens 2018 tournament at San Francisco's AT&T Park on July 20-22, 2018, the first rugby world championship of any form to be held in the United States. "We are very pleased to be hosting this signature event in the nation's capital in June," said David Sternberg, Rugby International Marketing CEO, "Not only are we bringing two established rugby nations together for an amazing match, we are also activating a large and passionate regional rugby community and accelerating the growth of the sport's popularity in America as we head into the Rugby World Cup Sevens in July." Wales vs South Africa will take place June 2nd, 2018 at RFK Stadium in Washington D.C. Tickets will go on sale to the general public starting March 13th. Information on the event and tickets can be found at www.walesvsouthafricarugby.com.